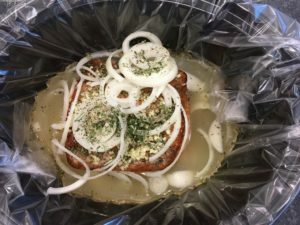 I typically prefer slow cooker “dump” recipes. You know, where you dump in all the ingredients and come back in 8 hours for dinner. But I’ve been busy lately, and I’ve had to use my slow cooker in place of my oven a lot more than I usually do. This pork roast recipe was delicious after a long day, even though it required browning the roast first (I actually did it the night before while I was cooking dinner, stashed it in the refrigerator overnight, and started the slow cooker in the morning). I grabbed some sides from Whole Foods on my way home, and dinner was on the table in 5 minutes. In a large skillet, heat olive oil over high heat. Cook pork roast on all sides until very brown. Transfer roast to the slow cooker*. Top with garlic, herbs, onion, salt and pepper. Pour stock around the roast, filling the slow cooker about halfway. Cook on low for 6-10 hours. Roast will shred easily using 2 forks for serving. *TIP: I use Slow Cooker Liners for easy clean up. 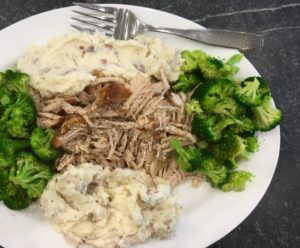 Copyright © 2016 Our Everyday Dinners - This is an easy recipe for how to make Slow Cooker Garlic Herb Pork Roast.